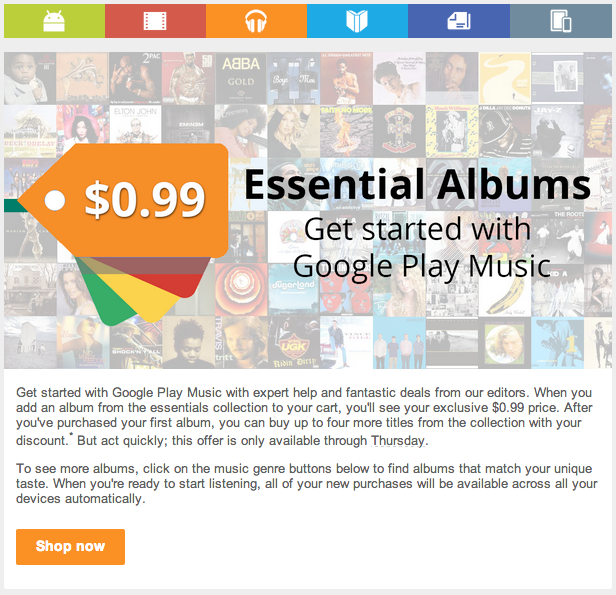 Haven’t purchased much music from Google Play? Considering how great Google Music’s free cloud music storage is, that’s understandable. However, Google wants to encourage folks to buy music from its digital storefront, and so the company’s offering select users classic albums at the deeply discounted price of $0.99. The deal, which features a diverse range of work including Nirvana’s “Nevermind”, Guns N’ Roses’ “Appetite for Destruction”, Kanye West’s “The College Dropout” and U2’s “The Joshua Tree”, is only available to customers that receive an e-mail notification from Google Play. Those that get the message can then purchase albums individually (up to 5 per account) at the sale price until 11:59 p.m. PST Thursday, January 30.